Inspired by a local doctor’s struggle with a debilitating neurological disease, six area bands will perform a fundraiser at the Claremont Moose Hall on Saturday, August 30. 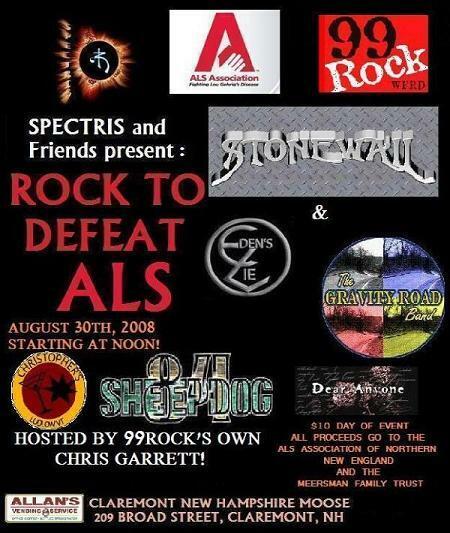 The show, called “Rock to Defeat ALS,” is the result of efforts by Chris Bergmann, guitarist for the hard rock trio (and benefit headliners) Spectris. Bergmann’s wife Karen has worked for the Valley Regional Hospital medical practice of Dr. Mary Joyce for the past 15 years. Karen frequently spoke to Chris of Dr. Steve Meersman, who was part of a Claremont surgical practice until he was diagnosed with the neurodegenerative disease in 2005. Upon learning of his ALS, Meersman moved back to Fort Collins, Colorado, where he died in April 2007. Meersman kept an Internet diary from the time he learned of his condition until his death. The “blog” provided a moment-to-moment chronicle of Meersman’s final months battling his illness, commonly known as Lou Gehrig’s Disease. His courage was more than remarkable. By the time ALS had finally claimed him, he’d completely lost the use of his legs, and all but ten percent of his hands. Yet he never stopped sharing his experience with others. For the last seven months of his life, a Colorado videographer captured his deteriorating condition on film. The entire “Meersman Experience” is archived on the http://www.onwingedfeet.com web site. Its many entries are a testament to Dr. Meersman’s incredible resilience in the face of a condition that he knew would ultimately kill him. To organize a benefit show, Bergmann put out a general call on his MySpace page, and the response was immediate. “Stonewall responded within ten minutes of posting the bulletin,” he says. Chris and the power trio’s front man, Josh Parker, are long-time friends. Within a few days, the lineup was complete, with power rockers Eden’s Lie, the Gravity Road Band (formerly Iron Box, they have two new members and a new name), and 84 Sheepdog, a Walpole-area band featuring ex-members of Ingrid’s Ruse and the Highball Heroes. Rock 99 radio personality Chris Garrett will emcee the show, and the Dartmouth radio station has also worked hard to make the show a success. Local rock station Q-106 also contributed to the performance, as well as Newport country station WCFR. The all-day concert, which starts at noon, will primarily benefit the ALS Association of Northern New England, with a portion of the proceeds going to a college fund for Dr. Meersman’s three children. Tickets are $10.00, and Bergmann says that anyone who wants to help out but can’t make the show can make a contribution through http://www.myspace.com/rtda, or by contacting the ALS Association of Northern New England through their web site – http://webnne.alsa.org.